Part of speech tagging is the process of selecting the most likely sequence of syntactic categories for the words in a sentence. It determines grammatical characteristics of the words, such as part of speech, grammatical number, gender, person, etc. In the case of Arabic language, this task is not trivial since most of the words are ambiguous as a result of the absence of vowels. For each word, we want at a minimum to identify its main lexical category (noun, verb etc.) and inflectional features (plural, past tense etc.) if any. We might also identify some quasi-semantic features (proper noun) or even specify a word sense relative to some lexicon. This article is best reviewed with its accompanied paper. 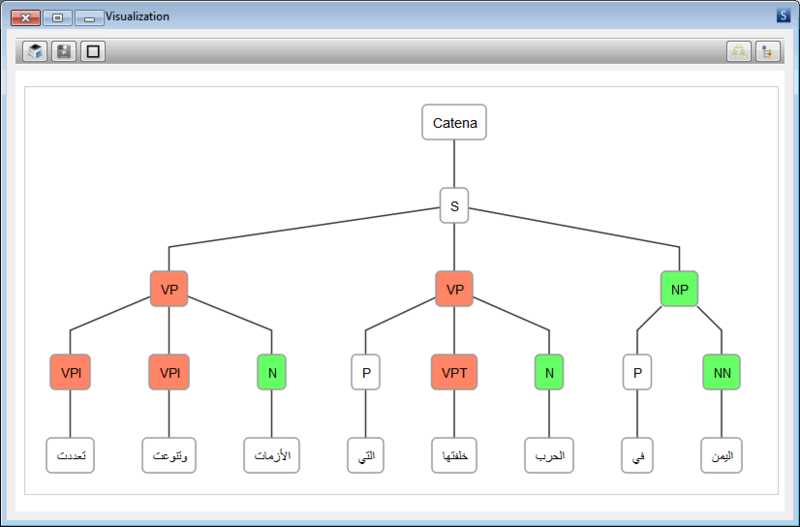 Kalmasoft PoS Tagger is the answer to most of the problems related to Arabic corpus tagging, a context-sensitive solution for each token using comprehensive set of syntactic rules, the output is a structured XML format but SQL database and CSV are among the other alternatives. 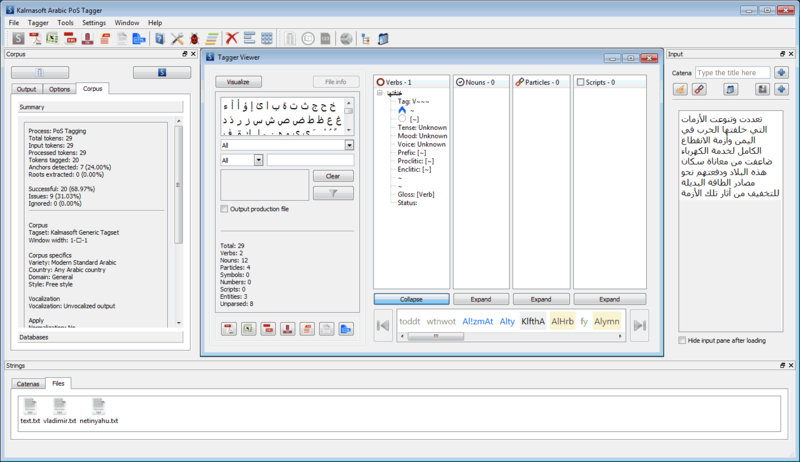 Kalmasoft PoS Tagger is designed to prepare Arabic annotated corpus since tagged corpus is more useful than an untagged corpus because there is more information there than in the raw text alone. Once a corpus is tagged, it can be used to extract information. This can then be used for creating dictionaries and grammars of a language using real language data. Tagged corpora are also useful for detailed quantitative analysis of text. The system's output -processed corpus- is therefore suited for machines rather than human although there exists a view interface for testing purposes which works well for short text; output can also be saved as HTML or TXT file. A screenshot of the MAPSSeman interface, you can view the technical specifications. You may also DOWNLOAD Evaluation copy. Check full documentation of Kalmasoft tagset here. (*) These are for reference only, the real module outputs simple version gloss (stems only).